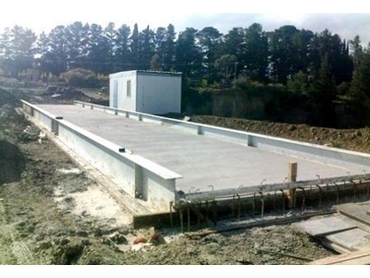 An Accuweigh concrete deck weigh bridge is being installed at a new landfill site at Bowral in New South Wales. Supplied by Accuweigh’s Lansvale branch in Sydney, the landfill weigh bridge will be used for weighing trucks bringing waste for disposal. Purchased by Bowral Waste, the 26m weigh bridge can support the potential use of B double trucks, which may be allowed on local access roads in future. The width of the landfill weigh bridge was also upsized from 3 metres to a width of 3.5 metres for easier vehicle access in slippery conditions. Concrete deck weighbridges are ideally suited for landfill sites as they offer better traction potential over steel deck weigh bridges in wet and muddy conditions. All steel work of Accuweigh’s Australian made weigh bridges are fully hot dip galvanised for superior corrosion resistance over cheaper imported weigh bridges with a painted finish. Accuweigh also supplied a PC with landfill weigh bridge software installed to track all weighing transactions over the weigh bridge and to supply management reports. A large digit remote display was fitted to allow drivers to read vehicle weight without leaving the cab; traffic lights were also installed to control vehicle movements over the weigh bridge. Bowral Waste purchased an AccuWash wheel wash bath to remove mud and organic matter from truck tyres before they left the landfill site, ensuring the new landfill site was fully compliant with EPA requirements. Australia’s leading supplier of weigh bridges, Accuweigh offers an extensive servicing network with eight branches across mainland states.